I am not a high-time Texan driver. Without digging through logs and adding up all the numbers, I’d say my time spent in the cavernous cockpit would barely top 100 hours, all of it civilian. Of that time, at least half was in the back seat either receiving dual time (in preparation for bigger birds with longer noses) or giving dual to Texan owners who wanted to know how to land/spin/aerobat their airplane. I’m not the definitive authority on T-6 performance and handling. I am, however, pretty typical of the average civilian pilot who is lucky enough to find himself strapped into one of the biggest pieces of iron commonly available to us. My viewpoint is grassroots . . . and reasonably current. Gene McNeely started flying airshows in 1986 and has been a stalwart presence on the #AeroShellAerobaticteam, flying a #R1340 Wasp-powered North American T-6. He can only guess at his total flying time behind the engine: “I would say 15,000 hours…probably more than that.” He does remember exactly how he got there, though. “I got out of the Navy and…started #cropdusting, and the first engine I sat behind was the [Pratt &Whitney] #R985, which we’d adapted to the Stearman,” he recalls. Oddly enough, I’m not sure where I flew my first T-6. It may have been the D model operated by Flight Safety out of Vero Beach, Florida. But while I’m hazy where my first T-6 time came from, there’s no doubt where I spent the most instructive time in the Texan: at Junior Burchinal’s Warbird school in Paris, Texas, during the early 1970s. I’ve put a lot of time into T-6s since then and I’ve enjoyed all of them more than I enjoyed those with Junior. I can, however, guarantee I’ve never learned more than in those ten hours with Junior. He believes firmly in working your buns off for your own good. And it worked. 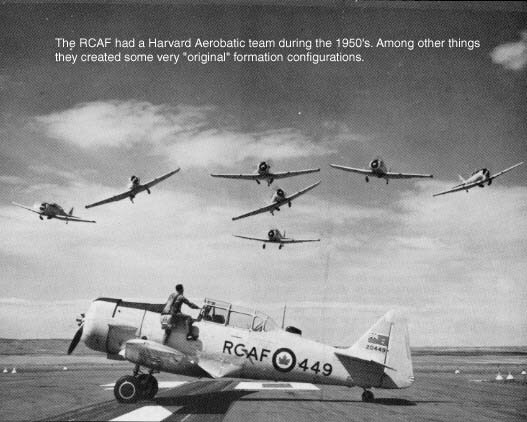 The RCAF had a Harvard Aerobatic Team during the 1950s. When you climb into the front hole of the T-6 it feels like a fighter. I’ve said this before, many times, but it’s true. And one reason it feels like a fighter is because North American designed the Texan to give the student the feel and controls of a big bird with less speed and a more forgiving nature. Describing the cockpit of a T-6 is like describing a cockpit of most World War Two fighters (especially North Americans), although it is quite a bit larger than something like a Bearcat. Beneath your left arm are all of the primary accessory controls, i.e. elevator, aileron, and rudder trims, as well as the landing gear and flap actuators. All of the electronic and radio goodies are on a console by your right arm. You have to dig deep to find the visual differences between a T-6 and SNJ and to differentiate the models of Sixes, which the Air Force, adopted. One sure clue of a SNJ or an early T-6 is a tail wheel lock sticking out of the left side of the canopy rail. Read the rest of the article at FlightJournal.com.